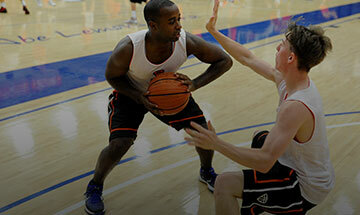 It has been said that the cornerstone of defense is not just effort but multiple effort. I argue that if defense was just about effort then we could pick up anyone off the street, offer the right motivation and they could get the job done. Defense is so much more than that. You have to know how to guard multiple actions and understand angles, assignments and rotations. That being said, every part of the game involves effort. In fact, that is a baseline for participation at any level of play. If you don’t bring your multiple efforts, you won’t be great at defense, and your game won’t be complete. Knowing that defense isn’t that easy, I want to offer 10 defensive commandments to help sure up that part of your game. Everyone wants to put the ball in the hoop, but few basketball players find that same joy in getting a big stop, holding a great offensive player below their season average or snagging a pivotal rebound that gives their team an extra possession. The game truly becomes easier when you can experience equal joy on both ends of the court. Don’t waste energy saying the same thing over and over again. Communicate your message loud and clear once or twice. The game happens fast and you need to be ready to communicate your new position and your player’s next move. Your help should typically be about one to two steps away, which is about a yard in either direction. If you can guard your yard, send the ball into your help and keep the ball in front of you. The offense will be forced to take tough, out-of-rhythm, contested shots. Many of those which will be off the bounce (the worst shot in basketball). Over the course of a game and a season, the percentages will favor your defense and the offense will make fewer shots which will hopefully result in you winning more games. Sometimes a better player having a great night will hit a tough shot and all you can do is tip your hat and move on to the next play. Keep doing your job, the odds will end up in your favor. I will guarantee you one thing: you will get beat. An offense player will have an incredible peek fake, explosive first step or dribble move that will beat you, and you will need help. You can’t quit on your play; you have to be ready to assume the next help responsibility. Special defenders will help as many times as needed whether it is their responsibility or not. They show up BIG with their voice, body language and mentality and get the job done. Basketball is a game of chess, and the ones who get caught playing checkers are routinely beat over and over again. You have to be thinking one step ahead at all times. Is there a screen coming? What kind of screen is it? Is he about to drive or shoot – and from where? Where is my next help responsibility? Anticipation is a key ingredient to success on either end of the floor. If you can couple anticipation with advanced preparation (you know your player’s tendencies), you will have success guarding them. It will look like you are in two places, but you know that you are just thinking a step ahead. Basketball is a game of chess; think one step ahead. Don’t get caught playing checkers. One of the easiest ways the offense can score is in transition. It’s your job to get back and stop the offense in its tracks. The two things you need to cover are 1) the ball and 2) the streaking offensive player running to the open lane or rim, trying to gain an advantage in the open court before the help is set. You and one other teammate need to communicate and decide who is going to stop the ball or get their head in the rim and make a stand until the rest of your teammates get matched up. It’s not enough to just get back. You have to be ready to make a play and turn sometimes what might be a bad situation into a good one by getting a deflection or funneling the offense away from an open lane. When you are on the court, you want to find yourself constantly faking and threatening the offense. Make them think you are playing the drive when you are really anticipating a jumper; jab at the ball handler, help early and bait the offense into a bad pass. When you are boxing out, it’s not enough to hit the offensive player. You have to hit first and get them off balance so you can go and grab a board. I don’t believe in the idea of holding a box out and letting it hit the floor. There is only so long you can maintain a box out without getting a holding foul called or just getting beat. A good offensive player wants the ball just as bad as you do so hit them first and then attack the rebound with everything you’ve got. It’s not enough to hit the offensive player, you have to hit FIRST. Seventy percent of rebounds come off on the opposite side of the rim. That means more than half of the rebounds you go after will have to be run down. After you hit your box out, get to the opposite side of where the ball was shot and start attacking the glass. You will turn yourself into a rebounding machine and gain extra possessions for your team just by playing the numbers on this one. Every time the offense comes down the court they are presenting a new problem for you to solve. Which player is going to shoot it? What set are they going to run? Who might get beat? Each of these is an opportunity for you to show up like one of three players. You can be a Preventer and solve the problem early by making a play on the ball or in help. You can be a Fixer and show up like a repairman and start plugging holes like a teammate getting beat off the bounce or a smaller teammate getting posted up. Or lastly, you can be an Eraser and at the last second take a charge, show up on a rotation and get a steal, or come out of “nowhere” and block a wide open shot or lay-up. No matter where you are in a defensive possession, there is always a problem to be solved, and you need to be ready to solve it. I am going to offer up one bonus commandment for defense and that is, “Have Fun.” The best competitors look forward to this end of the floor. They relish the opportunity to beat the offense at their own game of deception, timing and anticipation. It is an opportunity to be disruptive, earn easy possessions and show off your toughness. Take pride in your ability to not only give someone a bucket but also take one away.